The North America self-monitoring blood glucose devices market was valued at USD 5.5 billion in 2017 and is expected to witness growth of more than 4.5% CAGR from 2018 to 2024. 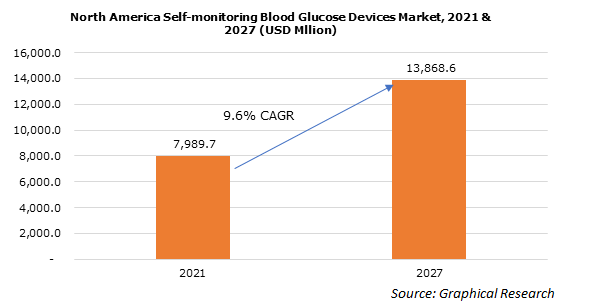 Technological advancements in SMBG devices and tremendous growth of home healthcare sector will drive North America self-monitoring blood glucose devices market over the forecast period. Home glucometers are inexpensive, portable, reliable and sensitive have led to high adoption of these devices. Growing demand for minimal invasive disease monitoring devices will positively impact industry expansion. Home glucometers use smaller amount of blood as compared to other conventional systems thereby stimulating growth of home-based blood glucose monitoring devices. Increasing prevalence of diabetes, frequent introduction of new SMBG devices in the market and rising awareness about the target disease will drive industry growth over the coming years. However, stringent regulations pertaining to SMBG devices and lack of reimbursement will hamper business growth during the forecast timeframe. Continuous glucose monitors (CGM) segment will witness significant growth during the forecast period owing to rising adoption of these devices along with increasing number of people suffering from diabetes. Growing demand for user-friendly homecare devices coupled with availability of several innovative CGM devices in the market will positively impact segment growth. Hospitals segment accounted for considerable market share of about 48% in 2017. ICU patients generally suffer from abnormal glucose levels hence they require continuous monitoring of blood glucose levels. Furthermore, availability of advanced continuous blood glucose monitoring systems and skilled healthcare professionals will contribute towards segment growth over the forecast timeframe. U.S. self-monitoring blood glucose devices market accounted for largest revenue size of USD 4.8 billion in 2017 owing to increasing demand for self-diabetes monitoring devices coupled with technological advancements in SMBG devices. Growing geriatric population base, susceptible to suffer from high blood glucose levels and growing adoption of sedentary lifestyle leading to augmentation in obese population will boost industry growth in the U.S. Prominent industry players operating in North America self-monitoring blood glucose devices market are Abbott Laboratories, All Medicus, Arkray, B. Braun Melsungen AG, Bayer Healthcare, Bionime Corporation, Dexcom, F. Hoffmann-La Roche, Johnson & Johnson, LifeScan, Medtronic, Nipro Diagnostics, Nova Biomedical, Sinocare and Trividia Health. Industry players are focusing their efforts on research activities to develop superior product and gain significant market share in the SMBG industry. For instance, In January 2018, Arkray entered into license agreement with Mellitus Health to broaden its diabetes care product portfolio and escalate its position in the market. Diabetes diagnostics market has been in mature stage from many years in developed countries such as U.S. However, high prevalence of diabetes has sustained growth and adoption rate of SMBG devices. Market players are therefore focusing on developing technologically advanced SMBG devices to fulfil growing consumer demand for home healthcare based user-friendly blood glucose monitoring devices to sustain in highly competitive market and gain significant market share. Major industry players are undertaking various organic and inorganic growth strategies such as merger and acquisition to sustain their position in the market.